It’s been a year since PSALMS (Putting Sport Alongside Local MinistrieS) started work in the North of Gloucester area in partnership with local churches there. What started out working solely in Innsworth, has since grown to include links with churches in Longlevens, Churchdown and developing areas such as Longford. It’s been hugely encouraging to see such development in a short space of time, with increasing numbers of young people hearing about the good news of Jesus. Relationships between PSALMS, local churches and local schools are also continuing to grow. Specific encouragements include the explosion of interest seen in faith-based sports clubs in Innsworth School; a year ago PSALMS had one lunchtime club with 10 attending, yet now there are almost 50 kids hearing and interacting with faith in an active way each week. Furthermore, what started as open football in the park last November, now sees 10 teenagers coming to the local church hall to play sport, drink hot chocolate and chat about faith in an open context. All these relationships will come together for the sports holiday camps in Feb and May, leading to a big camp run by the local church in the summer months. 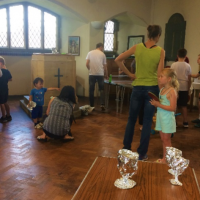 Holy Trinity Longlevens trialled ‘Sweaty Church’ and has agreed to partner in developing new opportunities to reach out and connect with local families, which is great news! Longford, the new housing development had a Bishop’s mission weekend in December which engaged with local families through craft and sport, all pointing to the Christmas story. This area has lots of exciting sports ministry potential as the new community expands. In addition to the above, St Andrews in Churchdown continues to grow and disciple its young people, but is also aiming to go into the local community with a sports ministry thread of their own, focusing on the local skate park. It’s challenging work, yet local schools and communities are becoming increasingly open to the idea of church being presented in a different way. Please pray for more Christians in the area to grasp the vision, and assist in building a more united Christian movement of the gospel in North Gloucestershire. Why do we do it and what are the effects? Watch the short video below to find out!